Jordan Withrow, sophomore Kinesiology major, not only received the Tarleton Student-Athlete of the Month award, but also won the Lone Star Conference Pitcher of the Week award three times this season. Even with all her achievements, Withrow said she does not think it is difficult to stay focused on her school work with all the excitement around softball. Regarding any strategies the TexAnn softball team uses, Withrow said she believes the team bond plays a major part in their success so far this season. “We just get in quality hours of work,” she said. “Sometimes we don’t have to be out here all day, but the time we do put in is quality. We’ve bonded on and off the field, which has helped with our success. With a big roster, a lot of girls sometimes may, or may not all be friends. But we are, and we find a way to get along and really care about each other on and off the field. We have so many personalities, and everyone is a lot of fun to be around, which is good because we are around each other a lot,” Withrow continued. #24 sophomore pitcher Jordan Withrow is now the first TexAnn in school history to strike out 200 hitters in a single season. Photo by Lorynne Benavides. 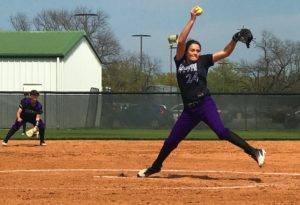 As a pitcher, there are two things Withrow says she remembers when she is on the mound – two Bible verses in the book of Matthew. “My teammates – they’d do anything for me and I’d do anything for them,” Withrow said. “They really support me, after the win against Angelo, they were like, ‘oh… well…. You got pitcher of the week again.’…They’re just really supportive. I have a really good family home base. I feel like everybody on the team is always genuinely happy for each other,” Withrow continued. Withrow is now the first TexAnn in school history to strike out 200 hitters in a single season.